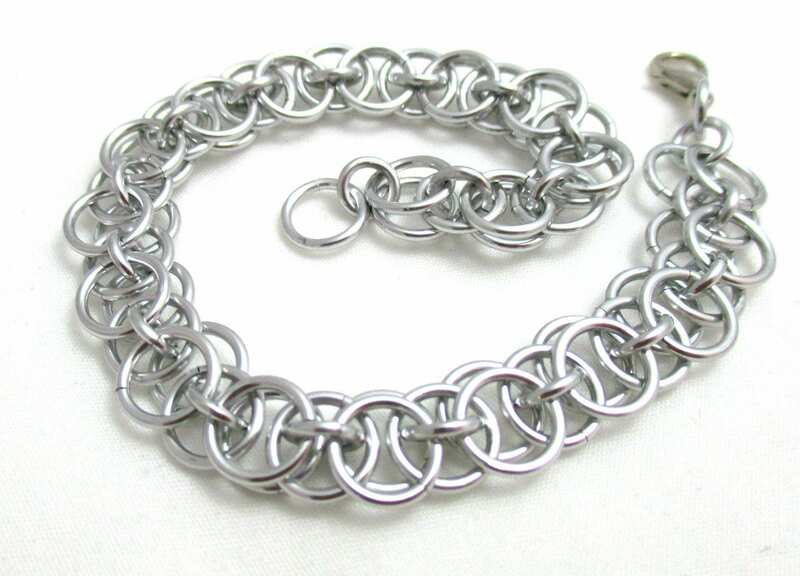 This Chainmaille Bracelet has been created using high quality, saw cut anodized aluminum jump rings. This bracelet has a slinky, luxurious look and feel. It's lightweight, and wonderful to wear. Aluminum is a wonderful metal to wear, as it warms to the skin each and every time you put it on. This bracelet will not rust, tarnish or turn your skin, even if you happen to get it wet. It's the perfect everyday piece. Each Chainmaille Bracelet is woven one ring at a time using high quality Bright and Anodized Aluminum Jump Rings. Saw cut jump rings are used to ensure smooth closures, so that your new jewelry will not catch your clothing or your hair. If you are looking for a different color or combination, I can absolutely accommodate that. Please send me your requests; I can't wait to work with you! Very pretty. Nice silver colour. Looks great with the Byzantine earrings.